32oz crowler poured into 12oz goblet. Poured a solid black color with just a thin cap of tan head that had low retention and lacing. The aroma had a nice roast note and a very mild sweetness. On the tongue though, the true nature of the beer appeared. Nice roast, a good sweet malt, and a nice amount of vanilla. The body was smooth, even, clean and had a semi-sweet finish. Drinkability was very good, the beer was very pleasant. Overall, a very nice brew. Certainly worth trying if you see it. Pitch black thin looking pour with a big carbonated head that fades quick and leaves zero lacing. Suggestions of vanilla and roasted malt in the aroma. 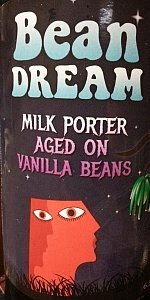 Notes of vanilla, cola?, light toasted malts, and a bit of off funk from the lactose. Too carbonated, almost soda like and thin. Finishes without a trace. It's off for a porter mouthfeel wise. I would call this average but it's a bit below average if I'm honest. Not quite my style and not quite a porter.